The Trump administration’s tough stance on immigration has some local health department officials worried it could spur cuts in federal funding and complicate a wide variety of programs, from efforts to battle the opioid epidemic to domestic violence initiatives. The Department of Justice (DOJ) sent letters April 21 to nine jurisdictions — including the state of California and cities such as Chicago, New Orleans, Philadelphia and New York — threatening to deny them agency funding because of their status as “sanctuary cities.” That federal assistance broadly supports criminal justice initiatives, but it often reaches well beyond police departments and courtrooms to include violence prevention programs and other efforts to address social factors that affect health. “These dollars go to everybody. You cut these grants — these are grants that protect the whole population,” said Dr. Georges Benjamin, executive director of the American Public Health Association. Local health officials also worry that other federal agencies may follow Justice in stringently implementing a controversial Jan. 25 executive order signed by President Donald Trump that mandates federal agencies take action to ensure localities comply with federal immigration laws and help deport people in the country illegally. That order — which has been blocked temporarily by a federal judge — could jeopardize a broad swath of vital community health services, not only for undocumented immigrants but for legal residents and citizens, too. The term “sanctuary cities” describes locales — cities, but also states, counties and other community entities — with policies known as “separation ordinances,” which separate local government responsibilities from those of federal immigration authorities. They often direct local police officers not to ask about the immigration status of victims, witnesses or suspects unless it is directly relevant to the case. They also exempt local law enforcement from complying with detainment or notification requests from the Immigration and Customs Enforcement (ICE) agency. In some circumstances, the local or state agencies declare that they won’t meet requirements to ask about immigration status when people apply for benefits. Officials from these jurisdictions say helping federal authorities detain someone — especially if that person turns out to have valid documentation — could be a violation of due process. The officials say that if they comply, they could be at a legal risk. They also argue that enforcing some of the federal directives is a waste of resources or could deter immigrants from reporting crimes or assisting in investigations because they are afraid of police. But there is no hard-and-fast definition of ”sanctuary cities” or federal delineation of which jurisdictions would be targeted under Justice Department directive. And health officials are already wary. The Department of Justice sent letters to nine jurisdictions threatening to deny them agency funding. What’s at risk? Take the opioid epidemic. DOJ has worked hand in hand with the Department of Health and Human Services to spearhead the federal government’s response — and allocates millions of dollars to local agencies for activities like prescription drug monitoring, helping people access the most effective models of treatment and equipping police officers with anti-overdose medications. “This is a big problem. It gets worse if you don’t have the resources to address it,” Benjamin said. In Baltimore, Wen said, the impact would likely be felt by the city’s Safe Streets program, a health department initiative meant to undermine gang violence with an emphasis on curbing shootings. The federal department has over the years put millions of dollars toward it, enabling public health officials to work with schools, local churches, community organizations and other groups. And, depending on the jurisdiction, other public health interventions could also be squeezed: domestic violence response programs, drug courtsand mental health courts, among other things. There’s also a lack of clarity about which cities might be affected. 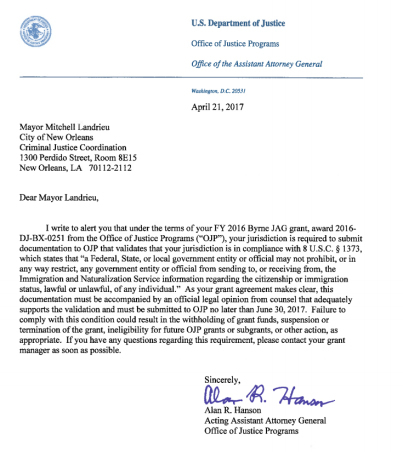 New Orleans, for instance, doesn’t self-identify as a sanctuary city but received the letter from Justice. The source of its scrutiny: Police officers don’t routinely question witnesses or victims about immigration status, said Zach Butterworth, the city’s director of federal relations. He argued the city’s policies are consistent with federal law and have been vetted by legal authorities. A cut in federal funds would be a setback, said Marsha Broussard, who directs the city’s health department. Ironically, she added, the city’s programs supported by Justice mostly benefit legal residents, since New Orleans has a fairly small undocumented population. Though the idea of losing the Justice grants causes concern, health department heads said the bigger worry is that other federal agencies will follow suit. Losing federal support from HHS, the Department of Housing and Urban Development and others could jeopardize activities ranging from HIV treatment, family planning services and Zika preparedness to routine immunization outreach and screening homes for lead. “Obviously it wouldn’t be good, and it would hamstring our efforts” to lose those funds, said James Garrow, a spokesman for Philadelphia’s public health department. 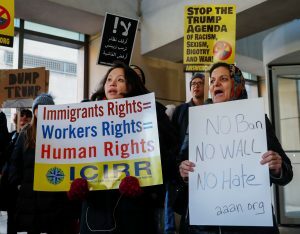 San Francisco — whose health department received at least $68 million in federal funding — filed suit in January seeking relief from Trump’s executive order, arguing the funding ban is unconstitutional. A federal judge in the city issued a preliminary injunction on Tuesday. The Trump administration has indicated it will appeal. Losing federal support could jeopardize programs ranging from HIV treatment, family planning services and Zika preparedness to routine immunization outreach and screening homes for lead. Other legal challenges are pending in Richmond, Calif., the Massachusetts towns of Chelsea and Lawrence, and Seattle. There’s also interest in Portland, Ore., and New York City. Their legal argument: The sanctuary cities directive is unduly coercive. In addition, the New York attorney general has issued a legal guidance arguing the Trump administration lacks authority to stop “sanctuary” policies. That has encouraged some municipalities to adopt strategies at odds with the federal stance, such as not asking people about their immigration status and not enforcing civil warrants from ICE. The legal uncertainty makes it harder for health programs planning around what federal defunding might mean in practical terms. And, until then, Benjamin said, they might have to scale back. Locally, that matters, Wen said.